Rhett, where are you?? Rhett?! 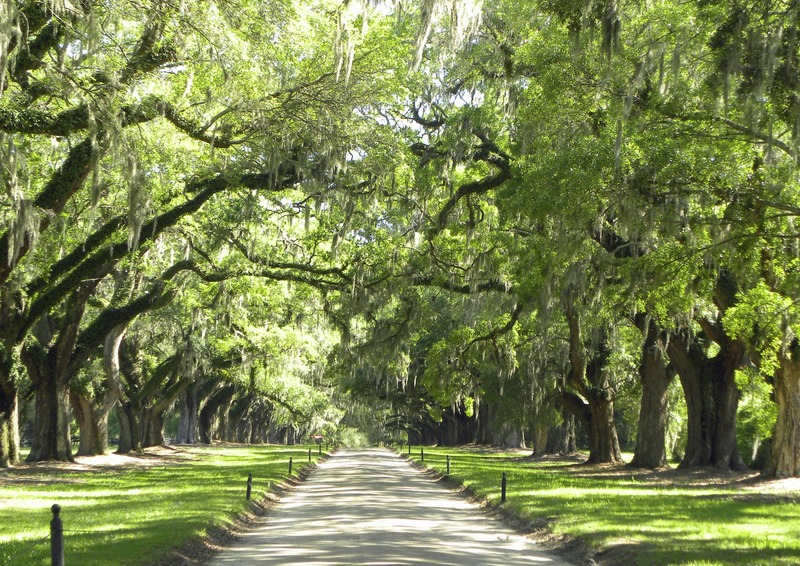 Some of my earliest memories are of my grandmother telling stories of the plantation her great grandparents owned in Georgia sometime before the Civil War. Since then, I’ve always wanted to visit one and imagine what it must have been like to live like Scarlett O’Hara in “Gone with the Wind”. Boone Hall Plantation was just what I envisioned. Perfectly placed at the end of a road lined with a canopy of mature live oaks dripping in Spanish moss is an elegant white columned manor house. 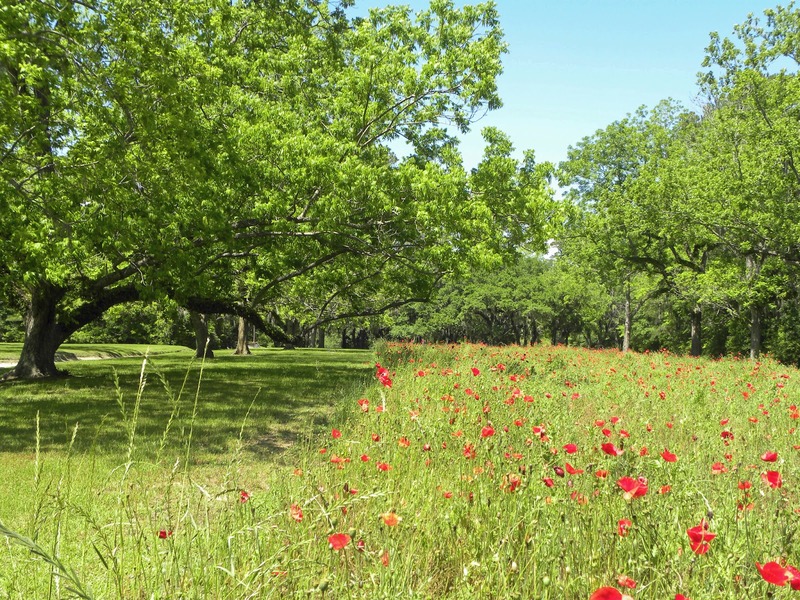 And as if to complete this unbelievably beautiful setting, there are even thoroughbred horses grazing lazily nearby! in a carriage to attend a cotillion through that? Spanish moss, named because it looked like the flowing beards of the Spanish conquistadors. Spanish moss isn’t moss at all, more like an “air plant”, getting its nutrients from the air and rainfall, and is related to the pineapple! It is soft to the touch and full of bugs! 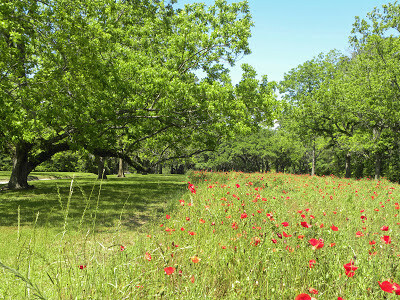 A field of poppies along the Avenue of Oaks. Is this gorgeous, or what? 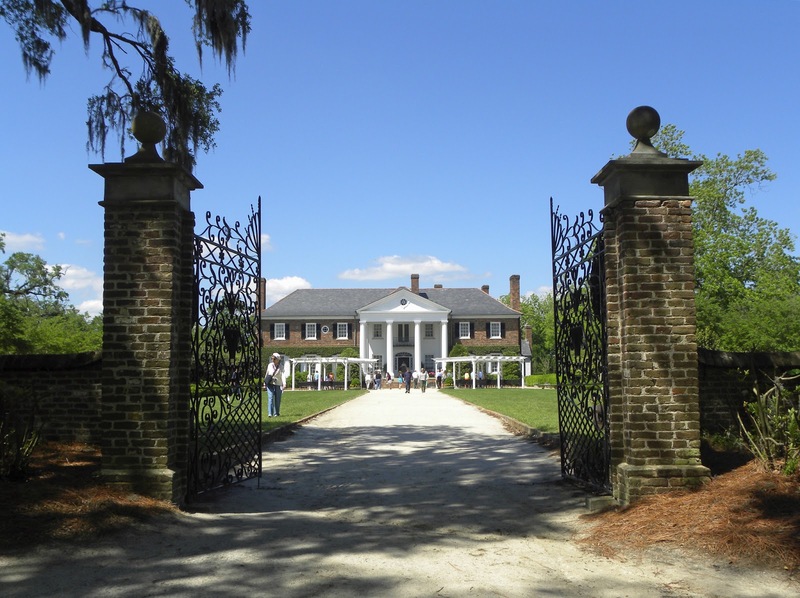 Boone Hall Plantation is located 10 miles outside of Charleston in Mount Pleasant, South Carolina and is the oldest working plantation, continually growing crops for 320 years. In 1681 a land grant was issued to Major John Boone as a wedding present from his father-in-law, but the first home wasn’t built until 1790. When Thomas Stone bought the property in the 1930’s he wanted something a bit grander and built the large Colonial Revival manor we see today. The manor house built in 1933-1935. Brick wall made from the clay in the tide pool beside the manor. The plantation is next to a large tide pool and one of its major industries was brick making. When the tide was out, slaves cut the bricks out of the exposed clay. 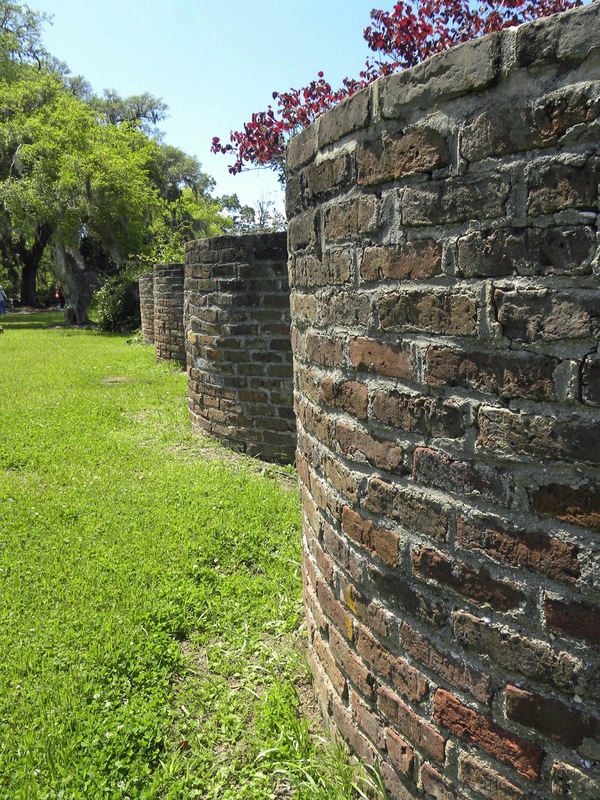 Fort Sumter is made from 70% Boone Hall brick as well as the slave quarters on the plantation. My grandmother also talked about how many slaves the family owned, which clouded my romantic fantasies of plantation life. Reminders that the plantations were worked by slaves are represented by the few modest brick dwellings running alongside the impressive tree lined entry way to the grand home. In front of one the slave quarters, a descendant of a plantation slave, Jackie Michaels, gives a moving and memorable presentation in the dialect of her ancestors about the Gullah people, their traditions, their family life, their language and their secret yearning for freedom. Jackie Michaels during her very moving presentation of Gullah life on the plantation. 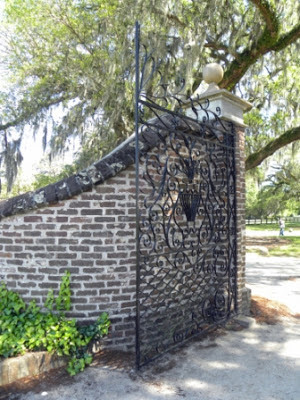 “Ma people, deh ware brought here to Boone Hall Plantation to farm da crops. Indigo ware da first cash crop, den dare ware cotton and da brick makin’ from da tide pool. Deh wohked from ‘can’t see to can’t see’, befoh the sunrise and aftah sunset ever day. Gullah, a people. 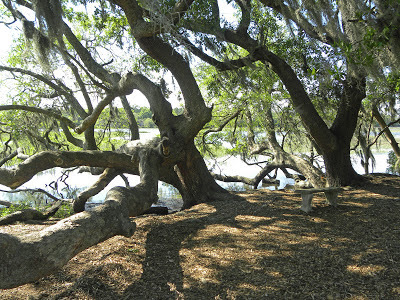 Gullah, a nation. You see deeze fine brick buildins? You be livin’in sumpin dis nice, you be a capintah, a hohseshoe man, or wohkin for da mahn ina big house as cook or housekeepah. Mose slaves, deh live inna board house wif a dirt floor and no winda—two, three family livin’ in it, mostly livin’ outside. Da field slave, he wohk and live in da fields. Gullah, a people. Gullah, a nation. Jackie’s presentation is one I will never forget. She is a true artist and storyteller, one who will capture your full attention and respect. Her performance was one of the highlights of the trip. 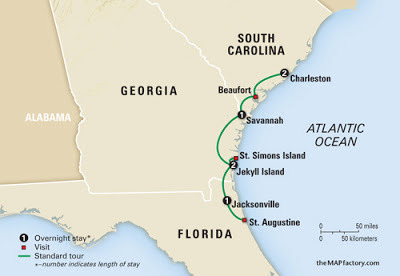 Next time: Walking with ghosts on the antebellum streets of Charleston! *Click on any picture for a full screen view.